Why did the big Beltway closure cause traffic jams across the region? The terrible traffic that rippled across the Washington region Thursday from Loudoun to Largo was largely due to a single major crash on the Capital Beltway near the Legion Bridge that sent drivers scrambling for other options. But there are only so many ways to cross the Potomac River. 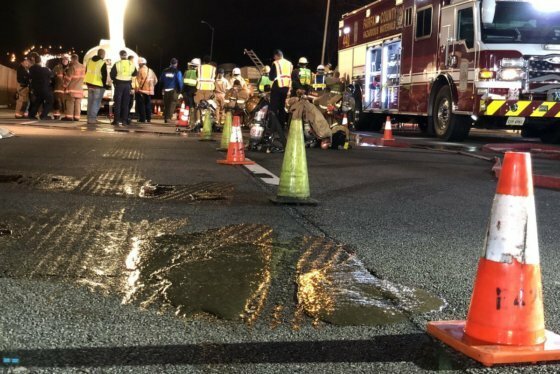 "This incident demonstrates just how fragile the traffic flow is across our region," said WTOP Traffic reporter Dave Dildine. The terrible traffic that rippled across the Washington region Thursday from Loudoun to Largo was largely due to a single major crash on the Capital Beltway near the Legion Bridge that sent drivers scrambling for other options. “We saw delays as far away as Leesburg, Lucketts and even Winchester yesterday because of how desperate people were to find an alternate route. But there are only so many,” WTOP Traffic reporter Dave Dildine said. “There are only so many ways to cross the Potomac River, and this incident demonstrates just how fragile the traffic flow is across our region,” Dildine said. Regional transportation agencies do not yet have hard numbers on Thursday’s diversions and delays, but about 240,000 vehicles a day typically use the Inner Loop of the Beltway at the Legion Bridge, and hundreds of thousands of other people were impacted as they tried to avoid the traffic jams elsewhere that were only exacerbated by cherry blossom visitors and Nationals’ opening afternoon crowds. After a horrific traffic backup that shut the Inner Loop of the Capital Beltway for more than 13 hours on Thursday, area drivers managed a normal morning commute. Here are some of the stories. The Metropolitan Washington Council of Governments plans to look into the impacts over the next few weeks, Systems Performance Planning Director Andy Meese said. “This is a time of year where traffic is a bit higher than some of the other times of year, Thursdays…are high, there are tourists in town this time of year, but I think that where you probably see that most was the breadth — you know the distance away — that some of the congestion occurred,” Meese said. Still, no matter what time of year, a 12-hour closure of the Beltway would likely have similar impacts, he said. Less than a year ago, part of the Wilson Bridge across the Potomac River on the other side of the Beltway was shut down for a similar length of time due to a truck fire. It caused similar traffic troubles. “When you look at an incident that ultimately lasted 12 hours, even a very long alternate route theoretically saves you time,” Meese said. All of those extra drivers on their own alternate routes creates additional delays elsewhere though, particularly with an incident somewhere like the Legion Bridge that impacts people with many different starting and ending points for commutes or other trips. Meese and Dildine both suggest staying put at work, having dinner nearby or finding friends or family to wait with to avoid the very worst of rush hour traffic during an incident like this in the future that has such multiplying effects. “There are more efforts than ever to try to manage and reroute traffic…but a big incident is a big incident, and it will take a long time to unravel,” Meese said. “Generally the adage is to go for the end run play — to go for the option farthest away and around from where the incident is occurring, but in the case of yesterday’s incident, these huge traffic incident, there are no good options,” Dildine added. 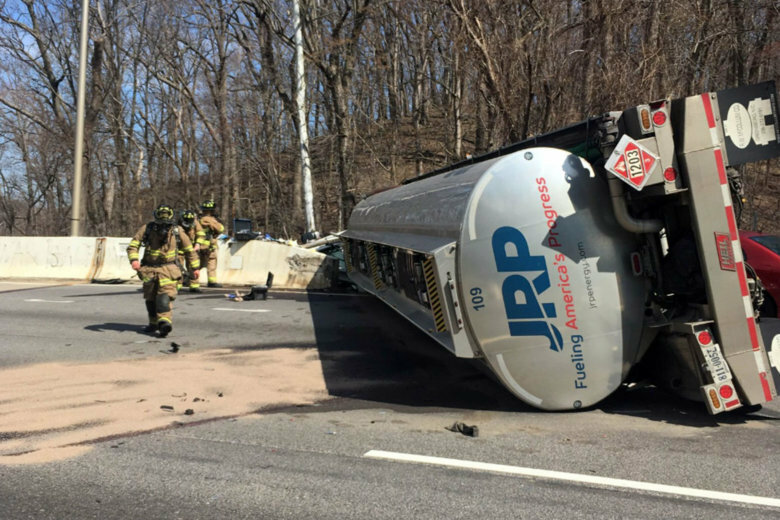 The region has been working to improve traffic incident management to clear crashes more quickly using drones and increased coordination, but in an incident where more than 8,500 gallons of fuel had to be removed from the overturned tanker Thursday, safety comes first. The gridlock led to desperation from drivers and some dangerous driving by people trying to save a few seconds. “So in the midst of the misery of sitting in bumper to bumper traffic and not moving for hours on end, you also are surrounded by some really dangerous behavior and lunacy at times, so it’s all the more reason not to put yourself in that position,” Dildine said. GPS navigation apps sending people through small neighborhood roads can cause extra frustration, since those roads quickly get clogged too. “No road is incident-proof. There are going to be incidents. People should be ready that things could happen sometimes,” Meese said. Northern Virginia officials had already planned an exercise this weekend meant to practice how traffic would be handled in the event of a terror attack on the region. Being prepared includes having an emergency kit with snacks and water in the car, knowing the options to take MARC, VRE or Metro that can zip past traffic troubles, and having backup plans to pick up kids from school or other programs. Metro had its highest ridership Thursday since the Capitals victory parade last June — 715,044 rail trips. While not all tied to the crash and traffic jams, evening trains did appear to be much more heavily used than on other recent Thursdays. The ridership was 12 percent higher than a similar day a year ago, Metro said, with the boost attributed partly to people avoiding extra traffic, partly to spring tourists with nice weather, and partly to the Nationals game. The 715,044 trips is well above a regular weekday for Metro these days, but remains below the average at the peak of ridership about a decade ago.